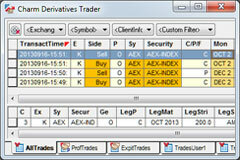 Charm Derivatives Trader enables you to trade on all derivatives markets of Euronext and Eurex. 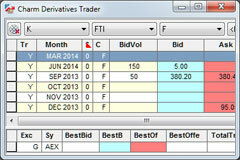 Furthermore, over fifty derivatives exchanges are available via the Object Trading infrastructure. 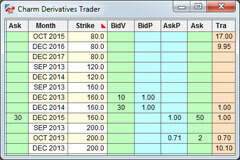 Charm Derivatives Trader is a speedy and user-friendly trading application for brokers and daytraders. 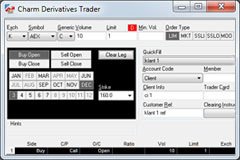 All exchange order-types are supported, including all variants of Prof Trades and Block Trades. In addition Charm Trader is known for its excellent support for trading strategies. Trades are reported in several ways so that you can pass them directly to your customer. Send them with one click via email or via create a custom report by export trades to MS-Excel. Daytraders are supported with quote keys which enable extremely fast and adequat reactions to market movements. One-click trading and instant feedback on order entry.